Your dentures are an investment and require care and attention to maintain their optimum performance. The fit of your dentures will have a profound affect on your oral tissues and health. An annual examination by Dr. Sharifi will help ensure your denture is functioning properly. 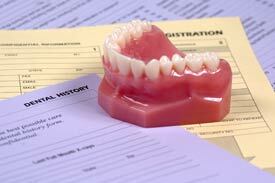 We maintain a once-a-year annual recall exam and check up for all of our denture wearers. During this appointment the dentures are ultrasonically cleaned to remove all tartar, calculus and stain. We update and review your health history and complete the very important oral cancer screening exam. In addition, small bite adjustments are made to help restore the excellent balance we create to provide success for our denture patients. Updating your medical and dental history with any significant changes is critical to maintaining your oral health and well-being. A variety of medical and dental conditions can alter a dentures fit. Update us to any new medications you’ve begun in the past year. Annual examinations can assist in detecting oral abnormalities including cancerous and pre-cancerous lesions. Early detection of these conditions is definitely beneficial for treatment. Ill-fitting dentures may cause bone and tissue changes and need to be corrected for your oral health. We will assess the retention, stability and support of your dentures with recommendations for solutions that suit your personal needs. Bite problems, speech impediments and tissue irritations can be caused by an ill-fitting denture and should be remedied. Leaving this condition unchecked can lead to complicated situations in the future. M. Nader Sharifi, DDS, MS can assess your dentures for cracks, chips, and broken or loose teeth and suggest solutions.